The Imazighen, or Berbers, consider themselves to be the original inhabitants of North Africa. Through centuries of rule by other cultures, the Amazigh people have managed to retain much of their language, dress, and many customs. Couscous Dance: Couscous is one of the many foods contributed by the Imazighen. To traditional music performed on mizmar and tbal (a large drum), the dancers make couscous in preparation for a harvest celebration. The jugs are hand painted with traditional Amazigh symbols. Scarf Dance: This dance features signature Kabyle scarf twirling and steps, such as the hip shimmy and rapid hip circles. Other movements with the scarves invoke planting seeds and watering. This style of dance is prominent at all Kabyle celebrations. Danse Maghreb formed in 2003. The company members have many years of performance experience and share a love of North African dance. Danse Maghreb is dedicated to presenting the music and dance from the region in culturally authentic and respectful performances and is the only company in the Western United States performing dances from Kabylia, Algeria. 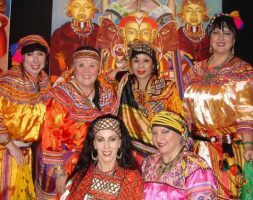 Danse Maghreb has been regularly invited to perform at public and private events for the Bay Area Amazigh (Berber) community.